The five-page comic entitled "Kamikaze Killer" depicts an American destroyer fighting off kamikaze planes shortly before the Allied invasion of Okinawa on April 1, 1945. Although the Japanese launched many kamikaze attacks against the Allied fleet off Okinawa from March 18 to 31, 1945, this story with its thin and confusing plot does not portray real history. "Kamikaze Killer" begins with a destroyer firing at an approaching Zero fighter and an oka (also spelled "ohka") rocket-powered glider bomb. The ship's guns shoot down the Zero, but the oka glider continues speeding toward the ship. In the last moments of the oka's approach, the destroyer captain suddenly stops the ship, and the oka screams past within five feet of the bridge and crashes into the water. Another group of Japanese planes approach the destroyer, but Combat Air Patrol (CAP) planes shoot them all down except for one oka. In the last moments, a gunner roused from sleep, after eighteen hours straight on duty, shoots at the oka heading straight toward him. The oka explodes just before it hits the ship. We've sustained five hits by the kamikaze, Captain! Our sick bay is filled…When do we get time to doctor our wounded and repair battle damage? The Captain somewhat coldly replies, "When the war is over, mister, and that can't be too long now!" This comic's destroyer shoots down three oka gliders in total. In real life, during the first attack by an oka squadron on March 21, 1945, all of the Betty bombers carrying the oka weapons were shot down even before the oka gliders could be released. The first successful attack by an oka occurred as part of the second oka squadron on April 12, 1945, after the date of this comic story. The oka could reach a speed of almost 600 mph during its dive after the ignition of its three rocket engines, which shows the implausibility of the downing of an oka by just one of the ship's guns at the last second. 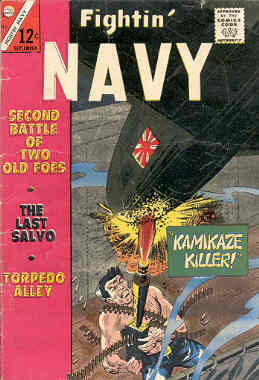 Of course, the comic's cover is even more exaggerated as a sailor tries to stop an incoming oka with only a machine gun. The unnamed destroyer in this story has the number of 582, which is the same as that of USS Conner (DD-582). Conner never went to Okinawa before or during the battle there, but the ship did participate in fighting from October 1944 to January 1945 in the Philippines, where kamikaze planes frequently attacked Allied ships. 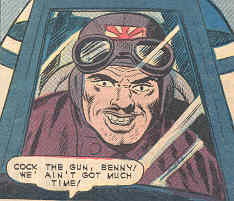 Fightin' Navy was just one of several war comics by Charlton Comics, which published a wide variety of genres from 1946 until it went out of business in 1986. Other titles included Fightin' Army, Fightin' Air Force, Fightin' Marines, Army Attack, and Attack at Sea. The September 1965 issue of Fightin' Navy has three stories in addition to "Kamikaze Killer," including one set aboard an American battleship at some unknown location in the Pacific and at some unknown date during World War II. This story entitled "The Last Salvo" depicts a Japanese bomber that crashes into the battleship. However, it is not clear whether this is an intentional kamikaze attack, since no crewmember uses the word "kamikaze" or "suicide" to describe the crash. The four stories in this issue of Fightin' Navy glorify the successes of the American Navy. "Kamikaze Killer" ends with the following words, "fighting a new kind of enemy…and doing it well, in the highest traditions of the naval service!" However, this story provides an unrealistic portrayal of Japanese kamikaze attacks by oka glider bombs.